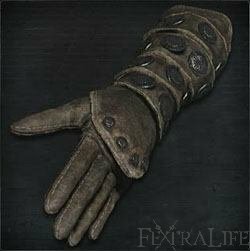 Executioner Gauntlets is a Hand Attire (Armor) in Bloodborne. It is part of the Executioner Set. "Gauntlets worn by the band of executioners commanded by the martyr Logarius. Later became the basis for all Church attire, with its heavy draping of Holy Shawl. As the great Logarius once said, "Acts of goodness are not always wise, and acts of evil are not always foolish. but regardless. we shall always strive to be good." Located In the hidden section of the library in Forsaken Cainhurst Castle that is accessible through the shortcut from the lamp. The path to the hidden section can be found on the second floor of the library. Look for an open window, jump down on a ledge and continue jumping down until you find yourself on a balcony, from there enter a room which contains a chest with the gauntlets. Lore related tidbits under The Mysteries of Cainhurst Garb & Architecture (Lore) and From Berserk to Bloodborne.